These FAQs relate to the Discussion Paper, Supporting Credibility and Trust in Emerging Forms of External Reporting. In what jurisdictions and in what industries is a more holistic and cohesive form of EER emerging? A summary of the most prominent EER frameworks and initiatives is provided in Appendix EER Bodies and Initiatives. Subsequently, a variety of international, regional and national organizations have developed EER frameworks and initiatives that encourage companies to report holistically on the broader impacts of their activities (for example, the International Integrated Reporting Council (IIRC), Global Reporting Initiative (GRI), and the Global Initiative for Sustainability Ratings (GISR)). In some jurisdictions, there are also regulatory reporting requirements (for example, the European Union (EU), the United Kingdom (UK), Germany, France, the Netherlands and the United States (US). While the majority of EER frameworks and initiatives are not industry-specific, there are some that provide industry-specific standards (for example, certain standards issued by International Organization for Standardization (ISO) and the industry sector standards issued by the Sustainability Accounting Standards Board (SASB). What types of stakeholders are calling for organizations to tell their wider story (not just financial) about the impact they have on society and its resources? There is increasing demand for more cohesive reporting from a wide variety of stakeholders: investors, governments, international organizations, non-governmental organizations (NGOs) and wider society (including employees, unions, suppliers, customers, regulators and surrounding communities). These diverse stakeholders have different information needs. The various EER frameworks and initiatives therefore target different stakeholder groups, depending on their objectives. See column B (“objectives”) and column E (“stakeholder focus”) in Appendix EER Bodies and Initiatives for further information. What are the relationships between the international organizations involved in promoting EER initiatives and how are they related to each other? Do they address similar issues or fundamentally different ones? Many EER frameworks and initiatives aim to promote a holistic approach to reporting. They capture a broad range of information relating to matters such as corporate governance, employees, the environment, human rights, bribery and corruption, society and community; similar subject matter to an integrated report. However, the work of some EER organizations has a narrower focus. In particular, several are focused solely on environmental matters (for example, the Carbon Disclosure Standards Board, CDP, Coalition for Environmentally Responsible Economies (CERES), the Financial Stability Board’s Task Force on Climate-Related Financial Disclosures and some UN bodies). There are a number of cross-memberships, collaborations and strategic partnerships between the bodies involved in EER. An example is the Corporate Reporting Dialogue established by the IIRC in 2015 (see row 5 in Appendix EER Bodies and Initiatives ), which aims to promote greater consistency between corporate the reporting frameworks of its participating bodies: CDP, CDSB, GRI, International Accounting Standards Board, Financial Accounting Standards Board, ISO and SASB. Are the findings of the IIRC consultation exploring assurance in the context of integrated reporting consistent with research by other organizations? The research of other organizations is broadly consistent with the IIRC’s findings. The GRI and World Business Council for Sustainable Development (WBCSD) have held discussions on assurance engagements with preparers, intended users and practitioners. These discussions emphasized the increasing need for enhancing the credibility of information. See also the GRI January 2016 Newsletter. See WBCSD Publication Assurance: Generating Value from External Assurance of Sustainability Reporting, February 2016. What are the criteria for an integrated report to be issued as recommended by the King Code, as required by the JSE Listing Requirements? The Integrated Reporting Council (IRC)  of South Africa, established in 2010, which is represented on the IIRC, endorsed the IIRC’s International Integrated Reporting Framework  for integrated reports in South Africa. The IRC develops local guidance on selected topics to enhance the development of integrated reporting in South Africa. The King III Code recommends that the Board should have controls in place to ensure the integrity of the integrated report. An integrated report should be prepared every year, convey adequate information regarding the company’s financial and sustainability performance, and focus on substance over form. The King III Code recommends that the integrated report includes commentary on the company’s financial results, discloses whether the company is a going concern, describes how the company has made its money, and conveys both the positive and negative impacts of the company’s operations and plans for the financial year ahead. It also recommends that sustainability reporting and disclosure be independently assured. The Institute of Directors of Southern Africa is currently consulting on the King IV Code, which is likely to become effective in 2017. The IRC of South Africa, established in 2010, is an association whose members are professional and industry bodies. The International Integrated Reporting Framework is available on the IIRC’s website. What type of information is required by the EU Directive 2014/95/EU on the disclosure of non-financial and diversity information (the NFR directive)? The reporting requirements set out in the NFR Directive aim to capture the wider impacts of a company’s activities. It includes requirements for reporting on bribery and corruption, employees, the environment, human rights and society and community. See row 24 in Appendix EER Bodies and Initiatives for further information. Are there criteria for ‘fair, balanced and understandable’ reporting in the UK? The Code uses the words “fair”, “balanced” and “understandable” in accordance with their plain English definitions. Therefore, the FRC concluded that it is not necessary for the Code to set criteria to interpret their meaning. The Code is principles-based and the company’s Board will need to apply judgment in making its assessment of whether the annual report meets these criteria. The UK Corporate Governance Code is available on the FRC’s website. Guidance on the Strategic Report is available on the FRC’s website. How are risk management, design and operation of control activities monitored by those charged with governance (TCWG)? Responsibilities for risk management, design and operation of control activities, and monitoring of controls, are allocated by TCWG and management to line functions within the entity . In the Institute of Internal Auditors’ (IIA) (see row 10 in Appendix EER Bodies and Initiatives) ‘Three Lines of Defense’ model , operational management is the first line and has ownership, responsibility and accountability for the assessment, control and mitigation of risks. The second line includes various control departments (such as compliance, risk, quality and IT functions) that monitor and facilitate effective risk management and internal communication of risk. The third line is responsible for overall monitoring and is typically the internal audit function. 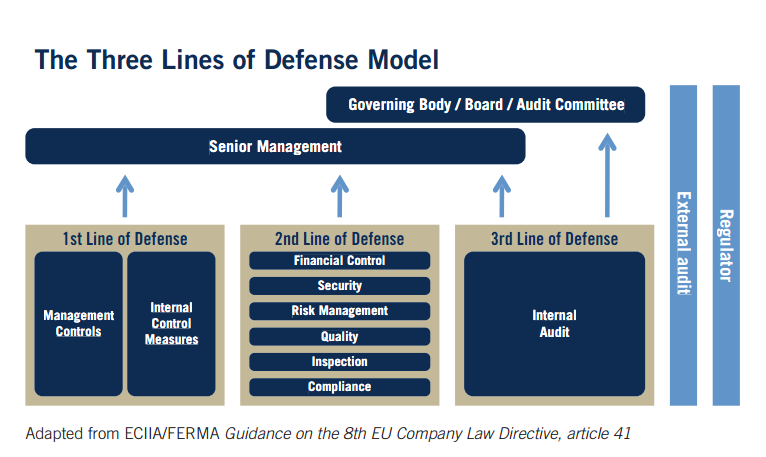 In the IIA’s model, the external auditor and regulators are outside the ‘lines of defense’ which are limited to internal line functions reporting (in the case of the first and second lines) to management and (in the case of the third line) to both management and TCWG. Communications from the lines of defense are sources of ‘assurance’ (for management and TCWG) that the entity is meeting its responsibilities for risk management and internal control. It has also been suggested in a recent academic paper  that, for a financial institution (FI), the external auditor and the regulator should be recognized as a ‘fourth line of defense’ that can provide ‘assurance’ that the FI is meeting its responsibilities for risk management and internal control. The proposal is based on the fact that both such players monitor these matters and communicate about them with each other and with the internal audit function and TCWG through protocols for auditor-supervisor-FI dialogue, which have been reinforced since the financial crisis. Have other organizations considered credibility and trust in relation to EER reporting? Yes, a number of other organizations have done so, including the IIRC,  IIA,  the AICPA,  GRI  and WBCSD. See AICPA Assurance Services: A White Paper for Providers and Users of Business Information.